The wife and I had passed by the sales gallery of Thomson Three umpteen times during the course of the past year that it has been around. However, due to one reason or another (wrong timing, overly crowded, too lazy etc.) we have not hit the project until this week. First and foremost, it may be useful to let our readers know that Thomson Three is already about 93% sold - the premium 3-bedder units are fully sold while only one of the 4-bedder remains. Many of the 1- and 2-bedders have also been taken up. So read on if you are not discouraged by the somewhat limited unit choices that are still available. 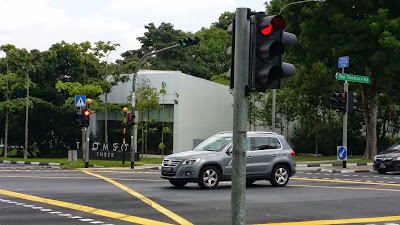 The sales gallery of Thomson Three is located at the junction of Upper Thomson Road and Venus Drive. However, the actual site of Thomson Three is actually at Bright Hill Drive - across the main road from Thomson Plaza. 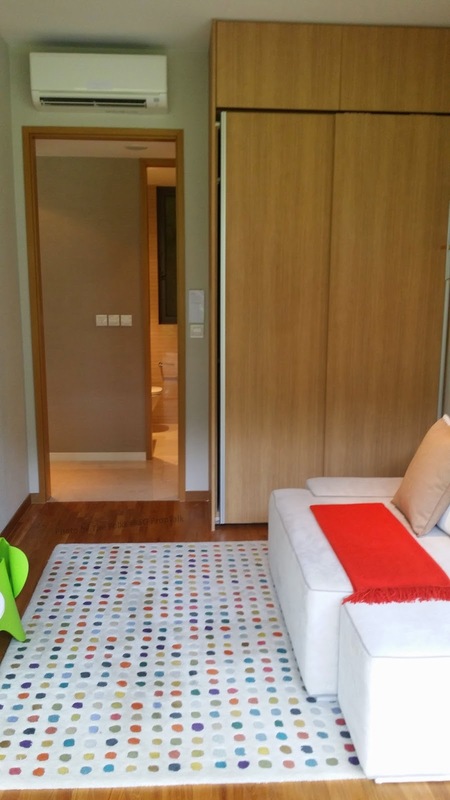 In terms of unit mix, Thomson Three offers apartments ranging from 1- to 4-bedrooms. 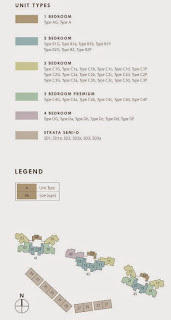 The 10 strata townhouses are 3-storey + basement semi-detached units with 4 bedrooms and 2 dedicated parking lots. 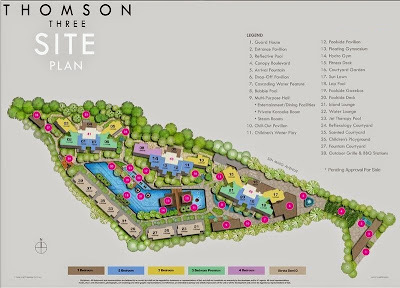 Facilities wise, Thomson Three provides a slew of what you will expect of "full facility" condos these days. However, nothing really jumps out at us when we were looking at the scale model. And it also suddenly dawned on us that all the three recent projects that we have reviewed do not come with tennis court. Maybe tennis is no longer that much of an "in" thing, but more probably because it takes up too much space. 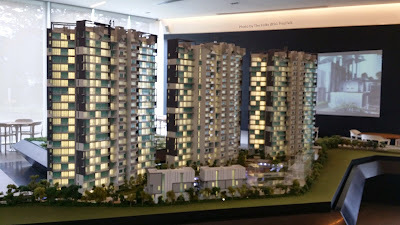 There were 2 showflat types on display at the sales gallery - both the 3-bedroom "premium" and "compact" units. 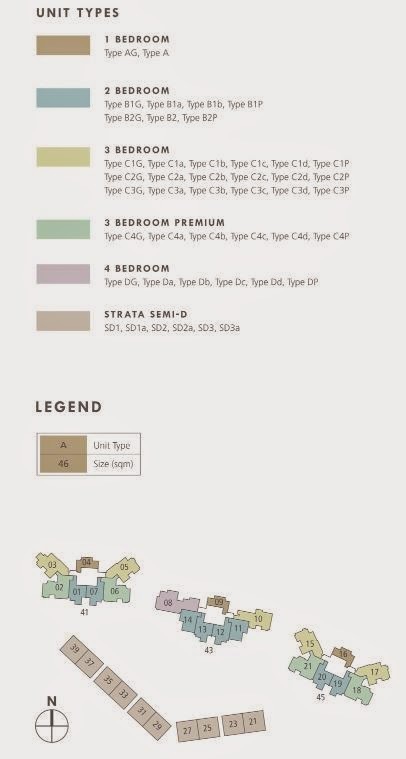 And although the former are sold-out, we decided to feature this because we feel the general layout is quite representative of both the 3- and 4-bedroom units within the project. 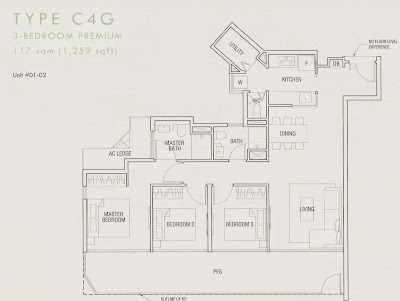 The 3-bedroom "premium" showflat on display is a ground floor unit (Type C4G) of 1,259sqft. 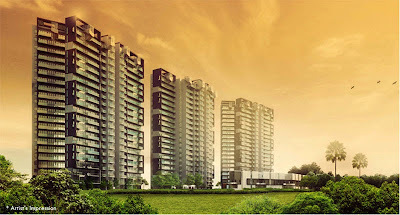 The typical "non-ground floor" units are about 1,141sqft. The first thing we liked about the unit is the foyer between the main door and the living room - maybe it's just us but the area adds that little bit of class to the whole apartment in addition to ensuing better privacy. 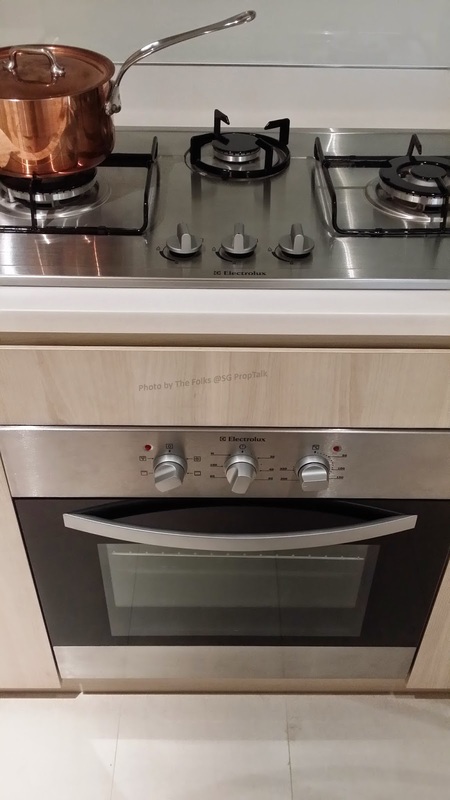 The kitchen is the first thing you see as you enter the unit. It is a long strip of width that will probably just fit two people working back-to-back. 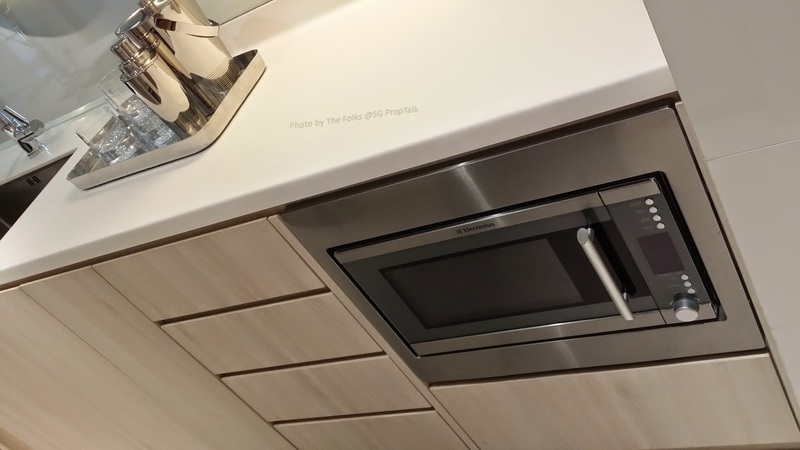 The kitchen comes with appliances (hood, hob, oven & fridge) from Electrolux and a semi-glass window partition that looks into the living/dining area. At the end of the kitchen is the utility room and the yard. If you intend to house your helper here, you probably will need to custom-fit her bed. But as the photo suggests, one can certainly do quite a nice job fitting out the utility if one chooses to. 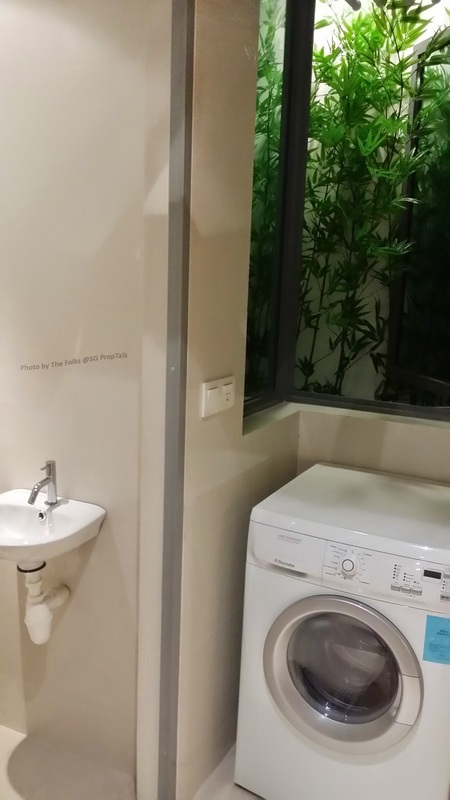 The yard area comes with its own bathroom (for the helper) and also houses the washing machine. A large window ensures adequate ventilation although laundry hanging may continue to pose a challenge. 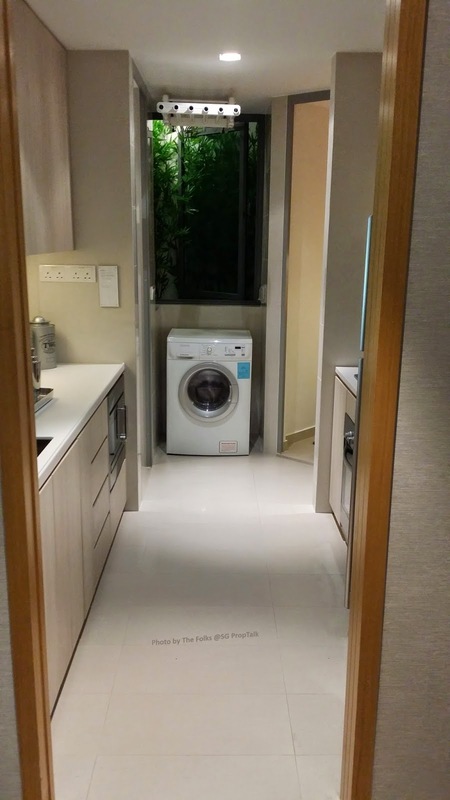 The living/dining area looked surprisingly spacious considering that this is just a unit with interior living space of no more than 1,159sqft (our estimate). 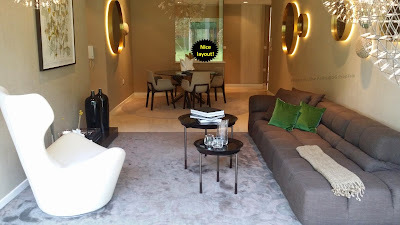 The layout is such that you get distinct spaces for living and dining - you may find it a challenge to place a dining table that will sit 6 (which is probably why a 4-seater round table was used in the showflat), but the living area will easily accommodate a long sofa plus a single-seater and still have space for a small TV console. The living/dining area comes with nice large-slab marble flooring and 2.8m ceiling height. 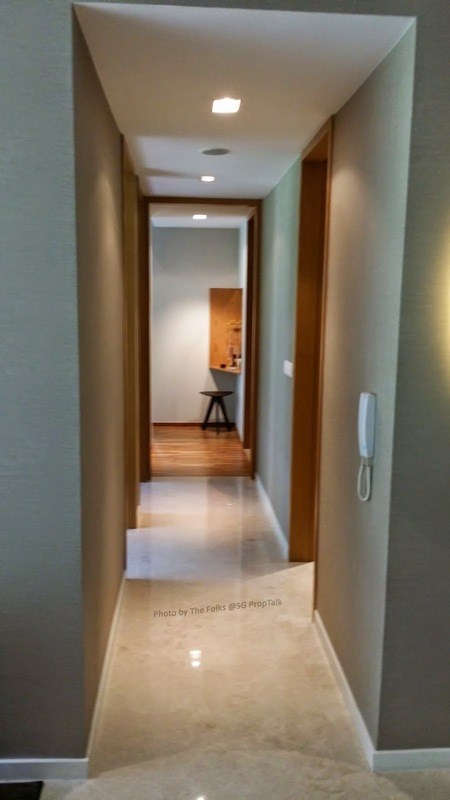 All the bedrooms are located on one side of the apartment - we prefer this layout as the bedrooms are away and sheltered from the sight and sound coming from the living/dining area. 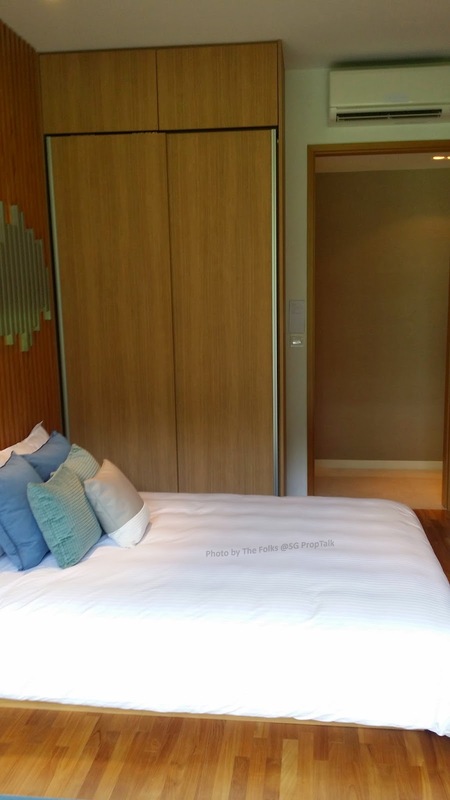 The 2 common bedrooms looked "typical" in size (our lingo for "not very big"). 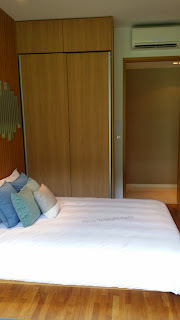 Having said that, both rooms are "queen-sized bed friendly" and better yet, we realised that you do not have to push the bed against the outer wall to make space. However, that's about all the furniture you can get into the room minus the wardrobe. All bedrooms come with parquet floors. 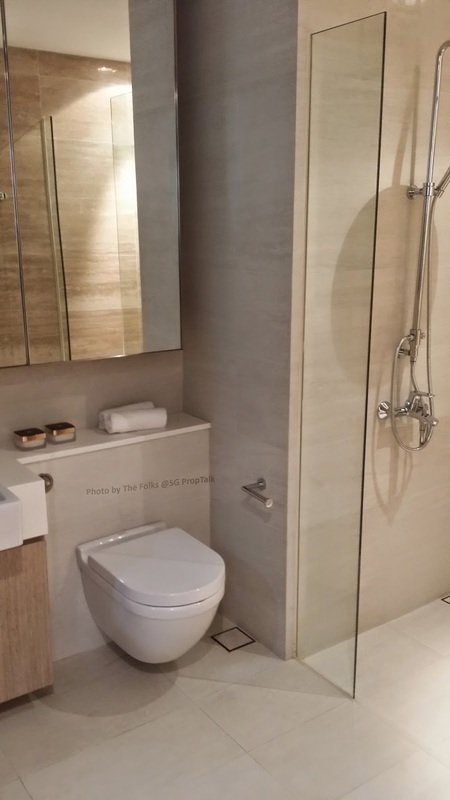 The common bathroom is small but adequate, which is probably a good space-saving idea. 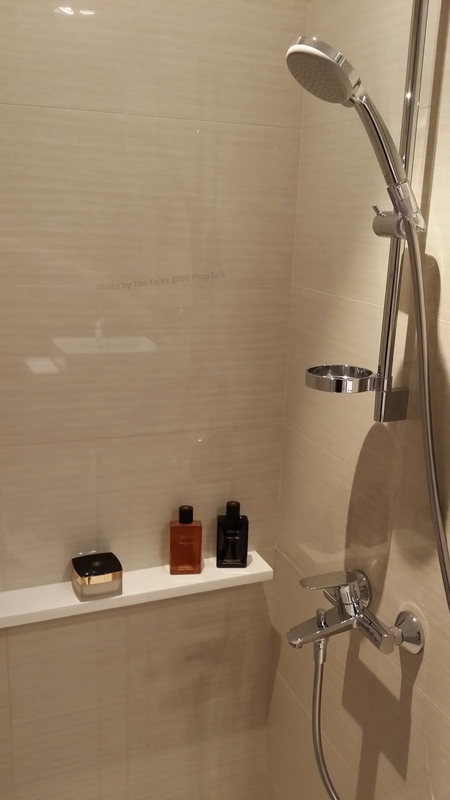 You get homogenous-tiled floor and walls and bathroom fittings from Hansgrohe (taps) and Roca (basin and toilet). The standing shower looked rather nondescript. 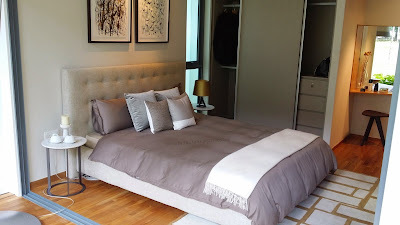 The master bedroom is again more suited for a queen-sized bed but will probably fit a king one. And as per all new developments these days, the 2-panel wardrobe is barely sufficient for one person much less two. 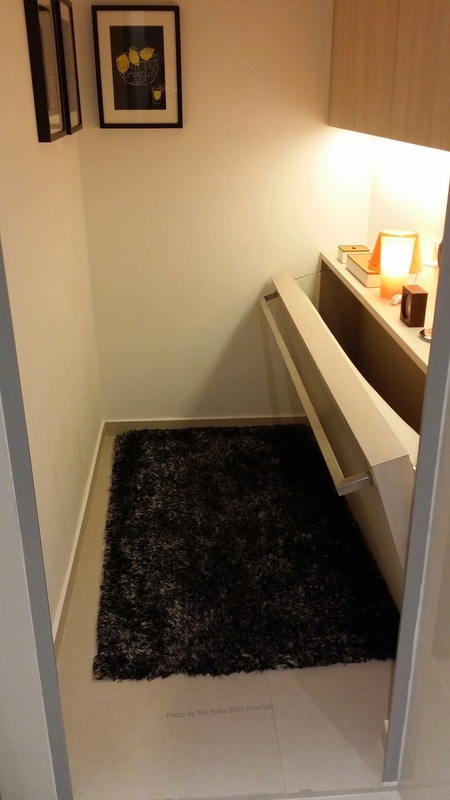 So we expect quite the conversation between couples on "who gets what" in terms of wardrobe space. The master bathroom is again small compared to some of the other developed we have visited. 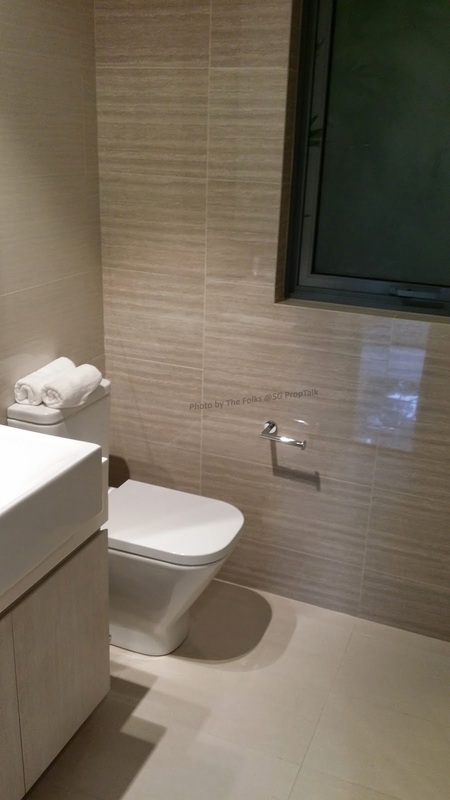 So those who expect a bath-tub will be sorely disappointed. Consolation is that the bathroom stall does come with "rain-shower". 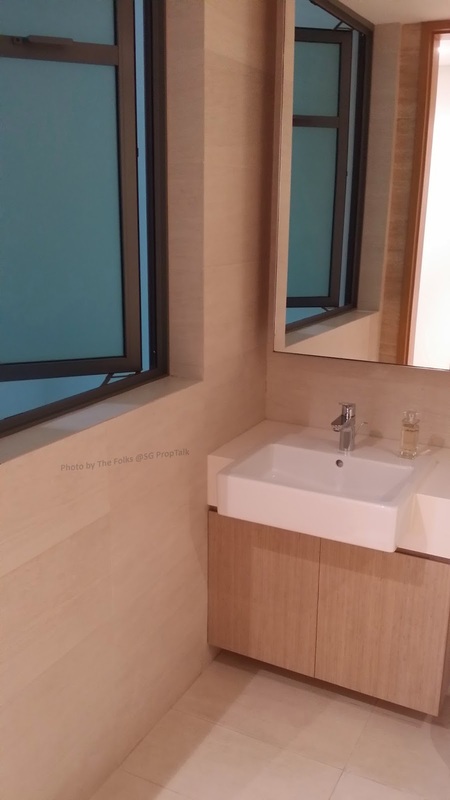 The floor and walls are decked with similar type of homogenous tiles as the common bathroom, but you get Duravit basin and toilet here instead of Roca- we wonder if the differentiation is more for cost reasons rather than aesthetics. Pricing wise, this is moot for the 3-bedder "premium" since they are sold out. But the "compact" equivalent is priced at around the $1,300psf level. 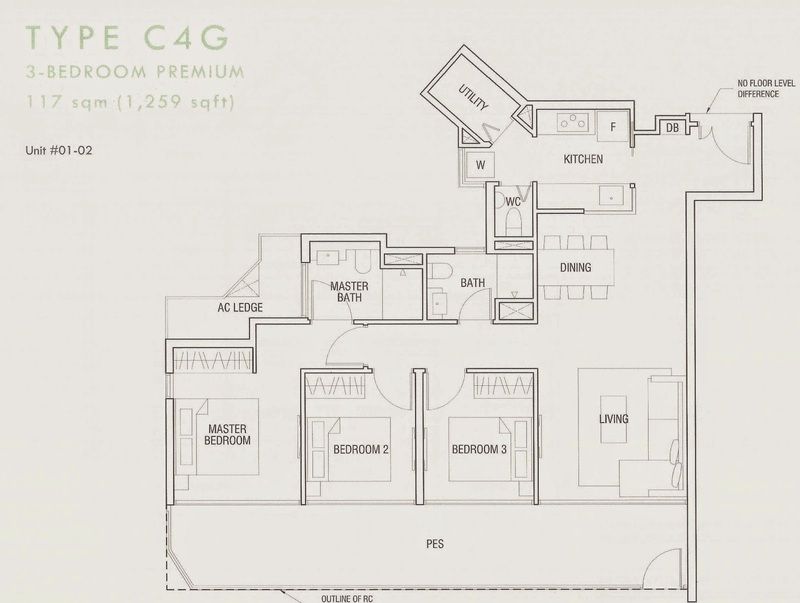 There is only 1 stack of 4-bedrooms, and the sole remaining one is a 1,485sqft third-floor unit that is currently going at $1.92 million ($1,293psf). 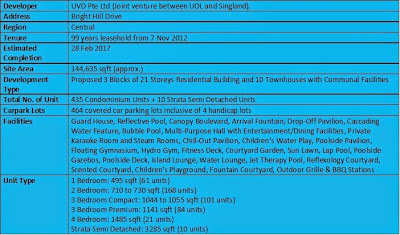 But if you are looking at the townhouses, you be happy to know that 8 out of the 10 units are still available. All are 3,285sqft units and priced at $3.23 million ($983psf). 1. 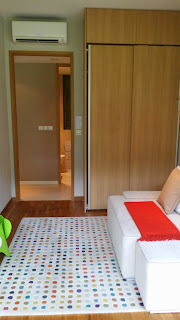 The wife and I like the layout of the 2 showflat units, which we find extremely functional and made the units seemed more spacious than what their sqft numbers tell you. 2. 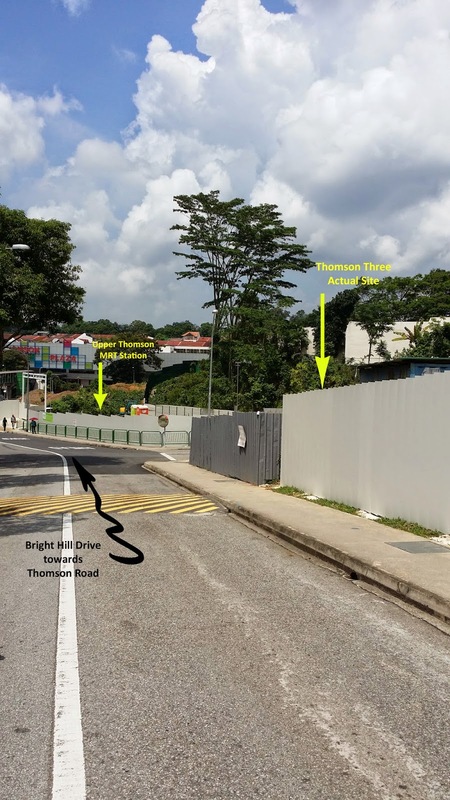 Did we mention that the Upper Thomson MRT station along the future Thomson Line (scheduled to be completed in 2020) is located just 100m from Thomson Three? And we are talking about actual walking distance from the main entrance to the station, not how Superman will describe it flying from point A to point B. 3. If you are a big fan of supermarkets (like the wife) or your greatest fear is dying from starvation (like yours truly), then Thomson Three is the ideal home for you. With Thomson Plaza a mere 5-minutes walk across the road, and the much touted "food street" along Upper Thomson Road also within walking distance, chances of you having no food in the fridge (or tummy) are almost zero. 4. 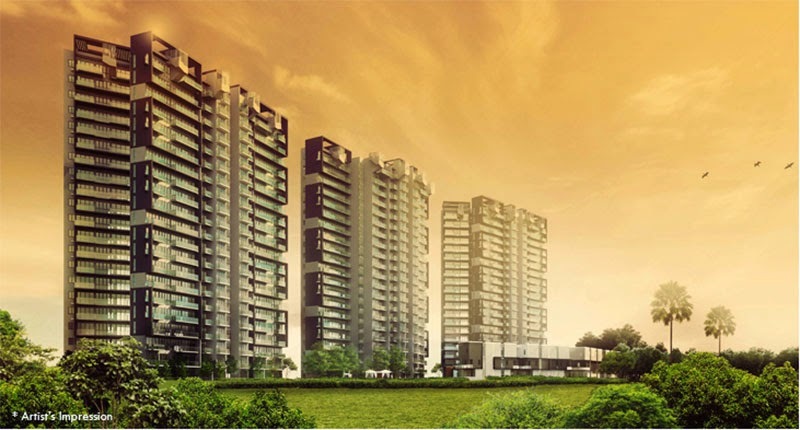 If you are nature lover, the higher-floor units at Thomson Three should provide a good view of the golf courses at SICC as well as the greenery and water around Pierce reservoir. 5. We are pretty certain that quite a few buyers of Thomson Three have "Ai Tong Primary" in mind. Yes, this much sough-after primary school is within 1-km from the project so your child will at least get the chance to ballot for a place into the school. 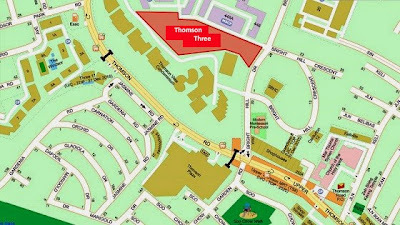 The downside is that we cannot identify any other primary schools within the 1-km radius of Thomson Three so Ai Tong may just be your one and only choice if you do not wish to travel beyond 1-km. 1. The cookie cutter facilities within Thomson Three - we can hardly find anything that made us go "wow". Maybe it's because of the irregular and narrow land plot that made everything looked squeezed and a tad claustrophobic. 2. The furnishing and fittings provided within the units do look a little pale in comparison to, say, what we saw at The Panorama, which has a lower price point compared to Thomson Three. 3. Bright Hill Drive is not a very wide stretch of road to begin with. 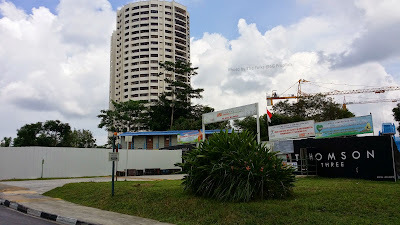 Currently it is the only conduit onto Upper Thomson Road for the landed households across from Thomson Three as well the HDB flats behind. With another 465 households coming online once Thomson Three TOP, this may create quite a bit of agony traffic-wise especially during the rush hours. So patience may be key to avoiding road rage. 4. Although we were told that the orientation of the 3 towers in Thomson Three ensures that all the higher-floor units are unblocked by Thomson View, we remain convinced that some of these units will be partially blocked. 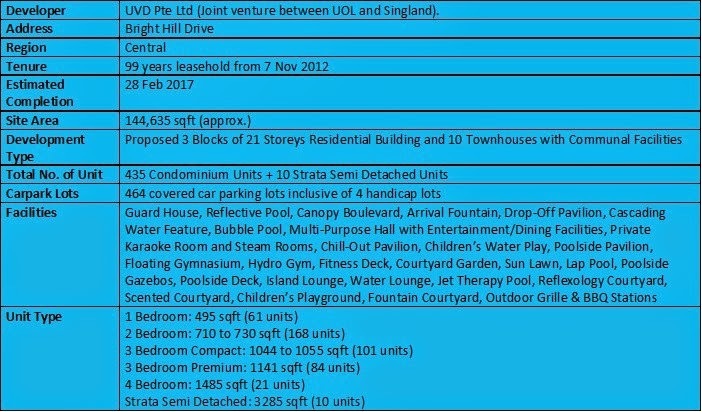 Ai Tong aside, one should definitely consider Thomson Three for the good unit layout and definitely its location (amenities galore within walking distances). Additionally, the upcoming MRT station will sure to give the development a value boost once the Thomson Line is up and running. 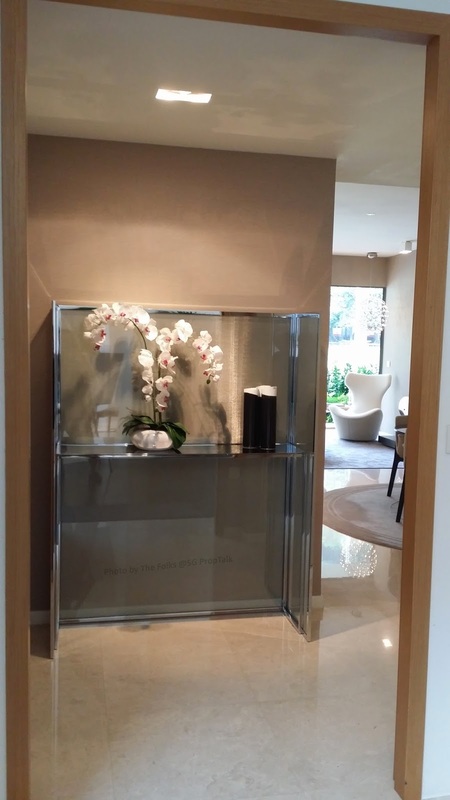 However, one must avoid being "overly comparative" in terms of the project's facility offerings and interior quality else you may be better off putting money in other developments. 3 comments to ''Thomson Three (Review)"
Glad to have read this. I was having "house-buying regret" symptom and your objective, detailed review allayed the concerns that I had :) I think my SO is of the view that I had made a very hasty decision on Thomson 3 while he was overseas. This aside, I enjoy your posts and reviews. Meticulous efforts are evident and most importantly, honest viewpoints are given. Kudos to you both. Hi Anonymous (24/8/14, 3:11PM): First off, congratulations on your new purchase! Every new housing project has its "plus" and "minus" so it is just a matter of balance. With Thomson Three, we do feel that the "plus" probably outweighs the "minus" so one shouldn't have too much of a "buyer's regret". And being very familiar with the location ourselves, we can attest to the fact that it is quite a nice neighbourhood to live in. And thank you so much for the kind words. It helps to reaffirm the notion that at least some people find our blog informative and useful. While the wife and I do not crave for compliments, it is always nice when one comes our way and acts as a motivation for us to continue writing. Please continue to support SG PropTalk and do tell your friends about us! Keep up the good work, and please post more pictures and writing about this place if you can, as it progresses. Thanks!